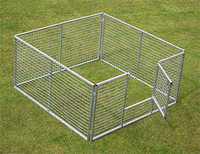 Our hot dip galvanised, steel puppy pens are a must have for any breeder. All our pens are very robust and structurally secure, yet they are easily moved. When not in use, the pen can be folded effortlessly, by the simple removal of a few adjoining few bolts. We offer a selection of different sizes and will happily give you a free quotation for a shape or size that is not listed below.